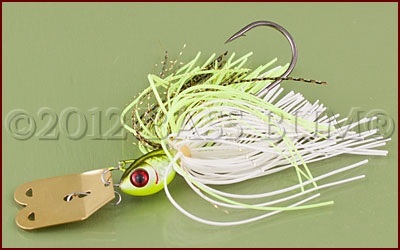 Present day bass jigs..... they're sure not your grandaddy's jigs! The fundamental lead jig shape is a round ball from which protrudes a hook. 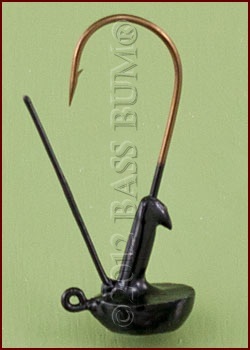 This simple device has enabled man to catch fish for a very generations. But just as other fishing lures have done, the humble jig has also evolved. It is now an extremely versatile lure. 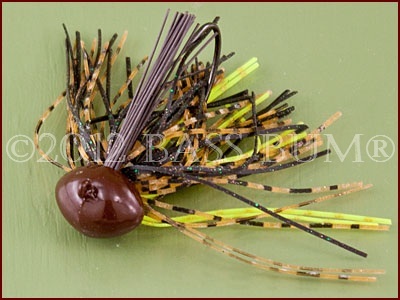 A "dressed" bass jig, especially with a trailer, more closely mimics a crawfish than most any other lure, a favorite food of largemouth and smallmouth bass. 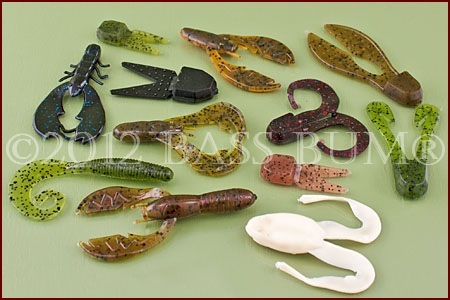 Bass fishing jigs are now available in a multitude of shapes, sizes, configurations and in all manner of colors. 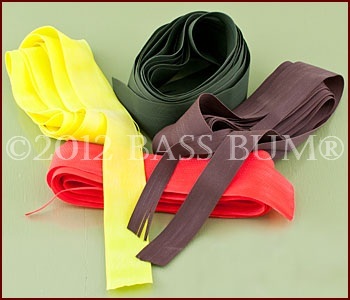 There is also a mountain of different skirt materials and colors to choose from as well as weed guards and rattles. Trailer selection is limited only by your imagination and creativity. So, whether your buying a jig "dressed" out of the package or buying "naked" jigs for tubes, grubs or other plastics or even to create your own, you can get lead jigs to fit your needs. Jigs are incredibly versatile. Ball Head jigs work in most situations. 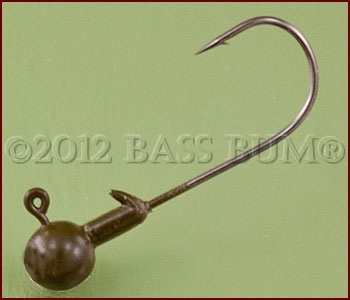 The hook eye of a ball jig often exits the top of the ball at 90° to the hooks shaft. Since this design can sometimes catch weeds other ball jigs have the eye of the hook exiting the head at a 60° forward angle. The eye is sometimes horizontal, sometimes perpendicular to the shaft of the hook. Football Head jigs are what? Shaped like a football of course. Encountering resistance when coming into contact with rocks or rock structure this shape causes the jig to tilt forward as the angler pulls on the line to move it over the obstacle. This action closely resembles the defensive posture of a crawfish when confronted by predators. For this reason, football head jigs are often dressed with trailers that give the appearance of crawfish pincers. The football design makes this bass jig fairly snag resistant and results in the jig moving along rocky bottoms "hook up". 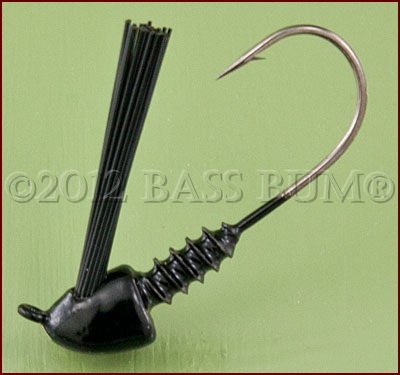 "Stand-Up" Head jigs are designed with "plane" bottoms of some sort on a weight forward head. This design causes the jig to rest on the bottom in an upright posture. An attached trailer will mimic a crawfish in a defensive position and the upright position contributes to better pick ups and hook sets. There are numerous "stand up" designs on the market. The picture at right is but one. Swim Jigs are relatively new to bass fishing and have re-introduced "horizontal jigging" into the bass jig world. There are a couple of dominant styles. One style has a head that is flattened into a wing shape somewhat like the Stealth fighter bomber, only with a more pointed nose. This allows the jig to "plane" near the surface during retrieve. It includes rattles and a skirt which make noise and impart action on the retrieve. These can be retrieved "swimming" if bass are after baitfish or worked on the bottom if they're slurping crawfish. It is quite effective on bass in shallow cover. Another version is what might be called "blade swimmers" whose design incorporates a blade attached to the front of the jig head. The blade generates a great deal of vibration when retrieved. They are more effective in sparsely covered areas like pebble banks as they are not very weedless. They work well around docks as well. 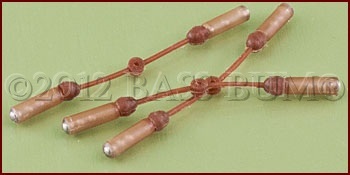 Hair Jigs are an important part of smallmouth bass jig fishing but can catch largemouth as well. They are generally small, weighing around 1/8 ounce, round in shape and a great choice for deep, clear, cold water most anytime. Natural hair, bucktail, squirrel, rabbit and calf being the most common types, is used for the skirt material. These materials produce a very nice pulsing action under water. Bullet Head jigs come in many variations but generally all have a shape which tapers in varying degrees to he front of the head. This design is considered aerodynamic and good at moving through grass and weeds. 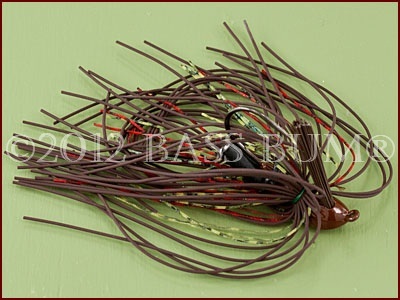 Many companies making bass jigs include this style in their offering. 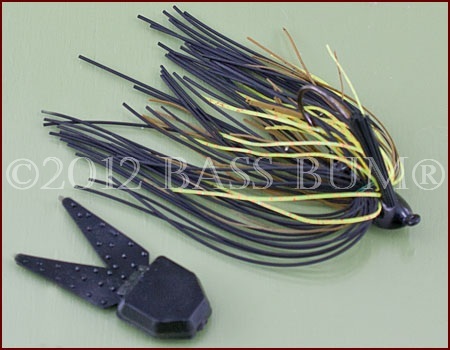 Shaky Head jigs are a style of bass jig referred to as "shaky head" jigs because of the way the angler works them. They're made with long shank hooks and incorporate some design of bait holder. Shown at right are a few I've used. These jigs are designed to hold a plastic worm on the hook in such a manner that it stands up and wiggles enticingly as the angler gently "shakes" the jig in place. Worms that float work best though there are many manufactured for this technique. When buying or making jigs hook size must obviously be given consideration. The diameter of the wire is important, as is the angle at which the hook eye protrudes from the head. Wire size should be determined by the thickness of cover being fished. This will determine line size which in turn impacts choice of hook size. For example, if you're fishing relatively open water, like gravel shoreline or around docks where cover is sparse, a light wire hook is a good choice. I use 10lb line on a medium heavy rod in these areas as the need to haul a fish out of cover isn't necessary and a thin wire jig hook suffices. If you're flipping in serious brush or trees using 20-25lbs line on a "flipping stick" a heavy wire hook should be used. There is less chance of the hook bending when jerking a large bass out of dense cover. 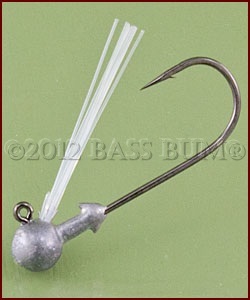 Any jig hook intended to be used with soft plastic trailers should have a long shaft. Eye angles can have an impact on presentation. An eye that protrudes from the front of the head horizontal to the hooks shaft seems to generate good action in rocks and wood in that it will hesitate when encountering an object and create a "tilt" up before moving over the object. A vertical position does better in grass, especially on a tapered (bullet) nose as it seems to shed grass better. I really haven't noticed a significant difference between the two though I'm convinced both give better jig presentations than a 90° eye angle. 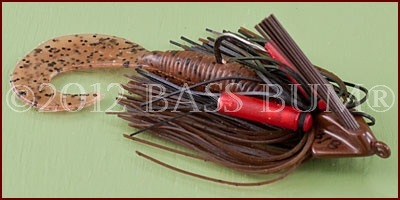 A weed guard is an important feature of a bass jig, especially when fishing in heavy cover. The reasons are obvious. 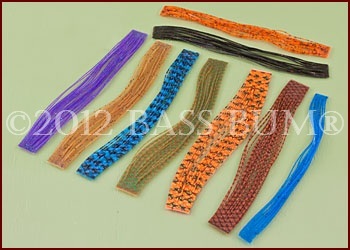 The picture at right is an example of a bass jig weed guard. They are usually made from fiber or plastic, though on very small jigs a thin wire my be used. The stiffness will vary with the number of individual strands in the head and the diameter of the material used. It's good practice to trim guards on bass jigs back either even with or about 1/8 inch above the plane of the hook tip. 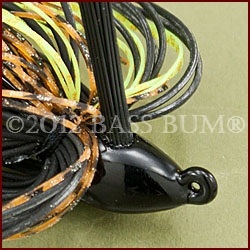 You can selectively clip out single strands to thin the guard and make it more flexible to enable easier hook setting. There are "Y" shaped guards also available but tend to be a bit stiff for my liking. Silicone skirts are the norm today, though "living rubber" is also used. I use both when I make jigs but feel the living rubber to be more active, even when the jig itself is not moving in the water. They are both flexible working well in both cold and warm water. Heavy skirts will contribute bulk that slows the fall of a jig. This is important, especially in cold water, as many strikes occur on the fall and you want the jig in front of them as long as possible. The action skirts impart to a bass jig can be modified by merely adding, deleting or shortening the strands in different configurations. Selective strands can be cut out thus thinning the skirt. They can also be shortened so they impart a nice flair during the fall or when moved on the bottom. Practically speaking, the color you use should be determined by water color and clarity. If the water is clear a combination of brown, green and a touch of orange can prove successful. Figure out what the local craws look like and try to match it with your jig. In stained water black and blue are a good combo, though this has proven a winner for me in most any water. Toss in a few metal flake strands to any color scheme and you're ready to go. White and red are good colors too. A simple guide is to use light more natural colors when the sky is bright and switch to darker colors when the clouds roll in. The final touch when "dressing" a bass jig is the trailer. Having so many available to experiment with provides the angler a great source of fun! Some guys will limit themselves to using the same two or three all the time. But what's the fun in that? Pork has long been used as a trailer and I would guess that when a bass takes a jig with a pork trailer it thinks it has actually bitten meat, and technically it has. Does this cause them to hold the jig longer? Seems logical they might and I have used it at times with success. I do think I have more time to determine if I have a strike with a pig jig (pork) than plastic. However, using pork can be frustrating since it will dry out rather quickly and can also ball up on your hook inhibiting a good hook-set. Plastic trailers have always been thought to become "stiff" in cold water so some anglers go to pork in the cold water months. Personally, I've never noticed a plastic trailer getting stiff in cold water nor have I seen a study supporting that viewpoint, so I'm not really buying it. The variety in shapes and colors available and the many scented versions lead me to use far more plastic than pork. If you read the section on bass hearing you know that rattles can get a bass' attention and arouse their curiosity. If they then look for the source of the sound, which happens to be your jig, and it appears to be something good to eat, they may well strike it. So don't shy away from buying a bass jig with rattles or adding rattles to ones that don't have them. It can't hurt and it may just increase your odds of catching the big bass. Want To Know More About Bass Fishing Jigs? Click here! Football Jigs! Stand Up! Show Us Your Stuff!